I could relate to Alex, so much. She was such a likable character. It isn't the main character that you love. It is Fred and Adlina's twisted relationship is what makes the story so enchanting and quirky. I found Adlina's overprotective nature was enough to freak me out. Fred was so sweet and tried to defend his sister, until she went overboard. I felt so connected to these characters in this book, even though it was such a brief glance into their life. 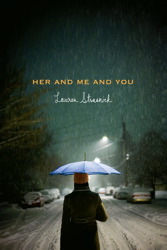 I enjoyed the plot of Her and Me and You. I loved how Strasnick made sexuality seem so unimportant and that Alex's orentation could be interruptated either way. I found this book to be really unique. Strasnick is a stunning writer that created a memorizing story that pulls you in from the first word. I am defitely going to have to read Nothing Like You soon. I would highly recommend this book to fans of Natalie Standiford's How To Say Goodbye In Robot.